If you’ve been a fan of the past two versions of the Caldorado and Caldorado II, you might have looked at the completely redesigned upper of the new Columbia Montrail Caldorado III ($120) with a raised eyebrow. I sure did. I’ve had the good fortune of testing and reviewing each of them, and let me reassure you, the midsole and outsole provide the same responsive, flexible ride as the Caldorado II, and the upper’s redesign has only improved the fit and overall performance of this door-to-trail shoe. The Caldorado III weighs in a few ounces lighter, in part due to fewer overlays, at 9.1 ounces (women’s size 8) and 10.1 oz (men’s 9) but retains the same 8mm drop with the stack height at 19mm/11mm, per Columbia’s website. The women’s colorways this time give you options between a more subtle grey/blue combo or an eye-popping green/grey/purple. The men’s colors have similar options. The sizing of the shoe remains true for me. I typically wear a 9.5 in Columbia Montrail shoes, and these were perfect. Overall, the heart and soul of this shoe remain unchanged, but the improvements in the upper have me pretty psyched about purchasing my next pair. The upper of the Caldorado III is now a seamless, abrasion-resistant material that feels like thin softshell to the touch. It almost feels like a lightweight road shoe in some ways with the roomy toebox being even more accommodating to various foot sizes and shapes than before. There are almost no overlays at all in the forefoot except for a few thin layers that almost feel like strips of thin taping which provide the slightest bits of support to the material but adds no compression points or strange ‘breaking’ patterns detectable to your foot. The midfoot is reinforced with this second welded layer which creates a comfortably secure wrap, keeping my foot united with the shoe regardless of terrain. The heat and moisture management in this shoe is even better than the previous models and debris is kept out much more effectively. It’s been a really hot and dusty spring and summer here in Colorado and my feet stay pretty dry and relatively dust free even without gaiters. On the occasion I trounce through a river crossing, the shoe dries quickly and I’m on my merry way without any signs of blisters or abrasions on my feet. The protective, molded toe bumper provides adequate protection from incursions on the trail without adding heaviness to the lightweight feel of the shoe. I again found the padded heel collar to be the perfect density to provide snug support and control but not to create undue pressure on the Achilles or ankle bones. The heel cup itself has one denser overlay medially and laterally to create excellent stability regardless of the nature of the trail I’m navigating. The mesh around the heel is reminiscent of earlier models yet doesn’t allow any debris to enter. Lastly, the gusseted tongue is padded just enough to provide a protective layer between the laces and the top of your foot and stays perfectly in place once you lace the shoes and go. I never have to stop to adjust the tongue or laces once I’m running. If it’s working well, why change it? 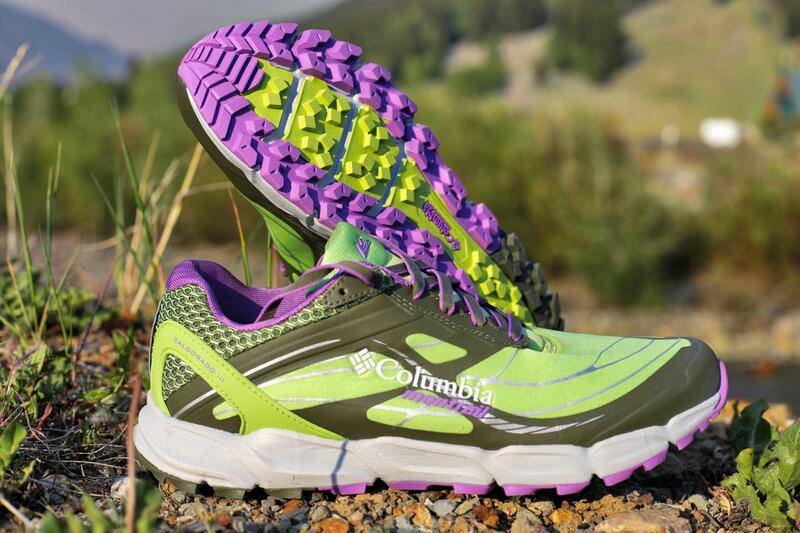 Columbia Montrail’s FluidFoam again provides excellent, firm, flexible cushioning while the FluidGuide adds that bit of gentle stability your feet and ankles appreciate as the miles or terrain angles begin adding up. 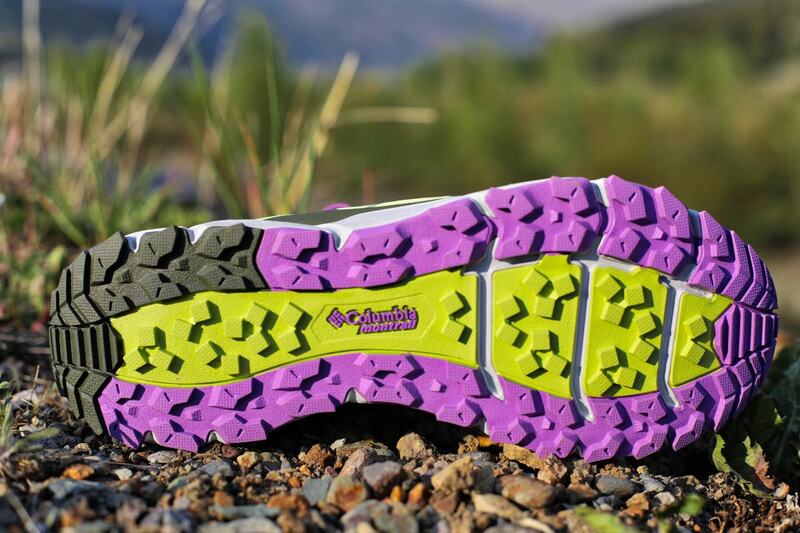 Forefoot protection is enhanced by the TrailShield protection plate integrated into the flex grooves in the outsole which adds to the overall flexibility of the shoe whether on uneven terrain or ticking off the miles on hard-pack trails or gravel roads. I don’t find this forefoot rock plate to be overly protective which works fine for the less aggressive rocky terrain I normally choose for these shoes. It’s quite possible for pointy rocks to impact your foot in the grooves or even through the spaces between the lugs, so I typically reserve burlier shoes for such trails. The only drawback I continue to find with this midsole is that, at around 250 to 275 total miles, I notice a distinct drop in the overall comfort for longer miles. By 300 miles, the shoe must transition to kick-around shoe status as the cushioning feels pretty packed out and my legs pay the price. I’d love it if Columbia Montrail could increase the durability of this midsole because the rest of the shoe has many more miles left. 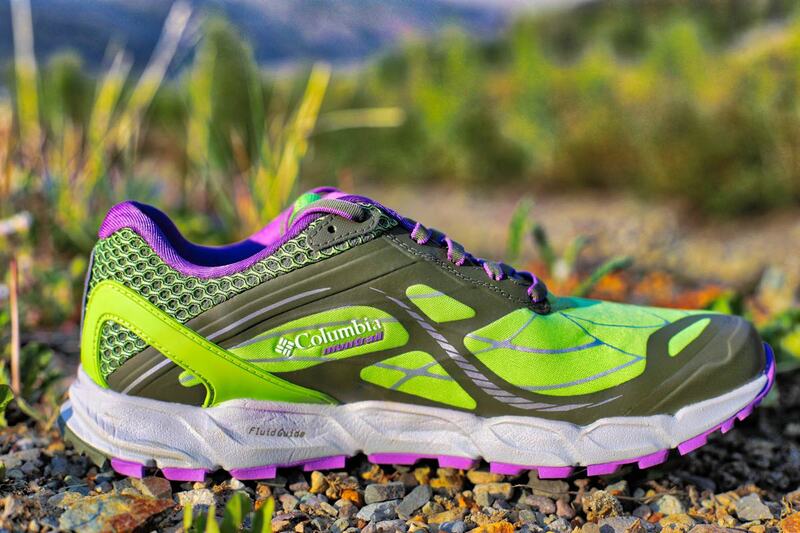 The Columbia Montrail Caldorado III medial upper. The outsole of the Caldorado III still consists of the full-length rubber outsole with the small, multi-directional, 4mm lugs with a denser lug pattern in the heel-strike and toe-off zones. The durability of this outsole is impressive again with very little wear shown at 300 miles. The flex grooves mentioned above divide the forefoot into three sections for improved flexibility through your stride pattern as well as over terrain features. The overall ride and heel-toe transition is very smooth even for someone with less natural fluidity of stride which definitely reduces fatigue in the feet and ankles over the miles. Obviously, the 4mm lugs do not lend themselves to incredibly steep fell running or significantly muddy or snowy trails, and I still prefer more support on significant talus, scree, and annoyingly rocky trails, but for most other trails, slickrock, and dirt roads, the shoes perform really well. 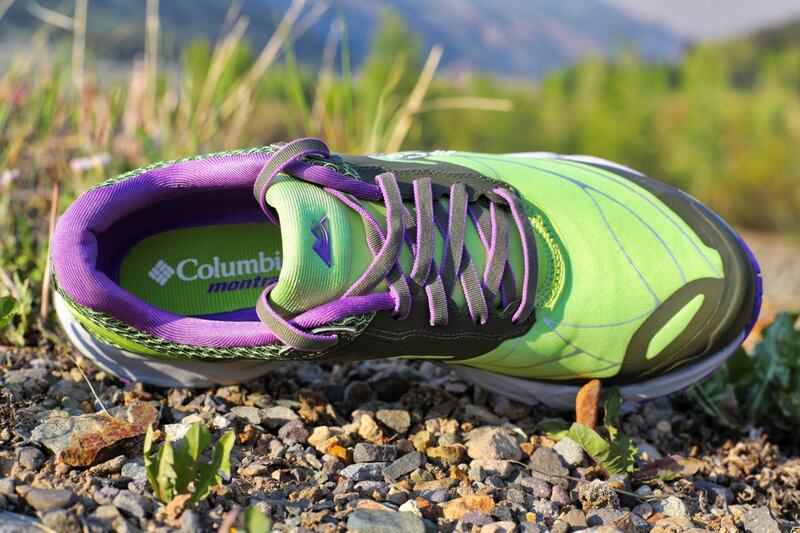 The Columbia Montrail Caldorado III outsole. The Columbia Montrail Caldorado III is one of my favorite door-trail shoes on the market, and I enjoy wearing it frequently on many of the trails in the Front Range of Colorado. I really appreciate the significant improvements in the comfort and feel of the upper as it’s eliminated any concerns I’ve had in past models. I’ve mentioned before that I love shoes that make me feel fast, and these do absolutely fly on San Francisco Bay Area singletrack in California, many of the Phoenix, Arizona area’s regional-park trails, and the Buffalo Creek trail goodness west of the Denver, Colorado metropolitan area even with me in them! It’s the perfect 50k shoe for me, and if your trails aren’t too pokey, I imagine many folks would find it adequate for 50 miles and beyond. Kudos to Columbia Montrail for really dialing in the Caldorado on this third iteration. I hope in the next version the only thing that changes is the midsole durability, so I can get the full mileage out of the rest of this fantastic shoe. 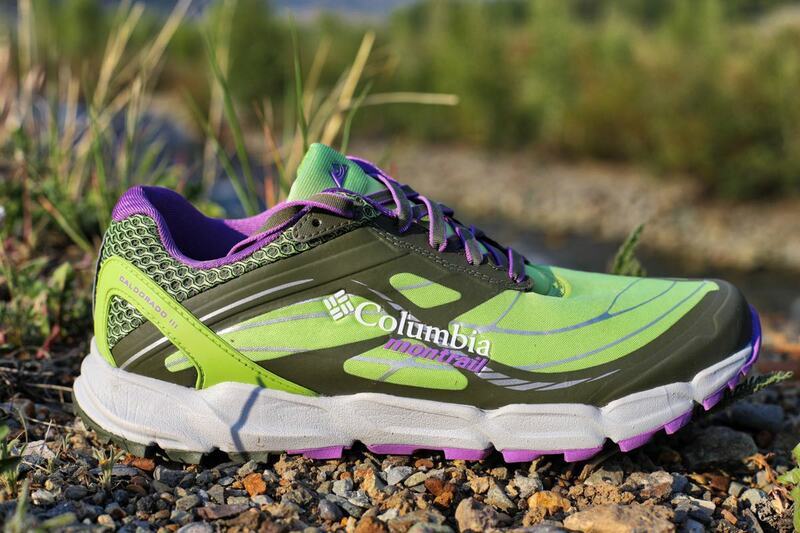 Have you run in the Columbia Montrail Caldorado III? What is your overall opinion of the shoe? If you have used previous Caldorado models, what do you think of the updates to the model’s upper? What do you think about the midsole’s durability? Does it break down earlier than the rest of the shoe for you? The Columbia Montrail Caldorado III view from the top. Kristin Zosel :is a mom, wife, ultrarunner, physical therapist (on sabbatical), and transcriptionist for iRunFar.com. Her love of steep uphills, high mountain environments, and Swiss “lovely cows” keep alpine visions dancing in her head and strong cappuccinos in her mug. Disclaimer: I've been sponsored by Columbia/Montrail for 8 years. In part, because of shoes like this that really work for me. This is one of my two go-to Columbia/Montrail shoes. I have loved each model of the Caldorado and have worn them for UTMB/Western States and other long races with zero desire to ever change my shoes/socks and with zero blisters. I like these for their neutral fit, and cushioned feel. At first glance, I was afraid the mesh on these wouldn't drain, but I have not found that to be the case, as they drain well. Thanks for this review. I reacquainted myself with Montrail shoes based on your review of the original. I've gone through three pairs of the Caldorado II (and one pair of the original). The only issue I've had is with some weakness in the upper at the forefoot flex point, so I'm happy to hear only the upper has changed. Otherwise I've found the Caldorado to be a great generalist shoe for moderate conditions for the 100k and 100 mile distances for which I've used them. I think the upper really is dialed in, and I haven’t noticed any flex points showing wear in the upper at all. Let us know what you think! I have 75 miles now on a pair of Caldorado III's. I think upper is huge improvement. The shoes feels cooler and also lighter underfoot. No signs of any premature wear. I imagine the upper might accommodate some foot swelling as well during longer efforts. We'll see. Are these any wider in the forefoot than the Caldorado iis? I tried the Caldorado iis and was impressed with them, but they were too narrow in the forefoot for me, and I don't even have wide feet. The medial side of my forefoot was pressed against the upper and hung over the midsole. The upper is more accommodating than the II, but I’m not sure the platform width is any different. Kristin thank you very much for the in depth review of the shoe, I've been shopping around for a running trail/hiking all arounder kind of shoe I intend to use besides hitting the trails close to my house but also as the only pair for a month long summer vacation on a rugged Med island where I might have to carry my pack for couple of miles or walk/run/hike on paved/dirt roads, speed hike almost vertical rocky narrow paths with jagged rocks, gravel and thorns. My last (road)running shoes had also a 8mm drop but gave me lots of knee pain so I'm kind of scared getting another 8mm drop shoe (since everybody says a moderate 0-4mm drop is best for the knees). Also I'm perplexed using quicklace vs traditional lace system since I've always used traditional laces. The positive reviews and the specs of the Caldorado III have made me thinking a lot about buying the shoe, also I like Columbia because they're not so mainstream plus them being the sponsors of the UTMB means they're serious about their trail shoes. An in-depth review of the Columbia Montrail Masochist IV.